Originality, which is part of the 1 District/1 Product Campaign (OTOP Product Champion) in 2003, as first and sole competitor from Phuket for 22 different products. 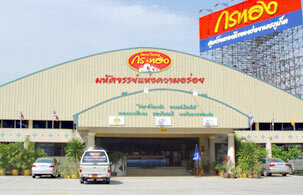 Apart from the factory there is a well-known outlet at Baan Lipon on an area of approx. 6 rai, at about 2.5 km from the Thao Thepkasatree/Thao Srisoonthorn Monument in direction to the Sarasin Bridge. Within this area a restaurant serves well-known delicacies, i.e. stir-fried Hokkien Rice Noodles, Phuket Curried Fish Parcels and offers an A la Carte Menu. The parking lot provides space for more than 100 cars, clean toilets, a Muslim Prayer Room, a Sala for relaxation, daily newspapers and refreshing cold herbal drinks.